Wilfair: Whimsy, Motels, Subterranean Secrets, and E.T. Whimsy, Motels, Subterranean Secrets, and E.T. Not sure if you've seen the recent story about the desert landfill brimming with old Atari E.T. game cartridges, but it has captured my fancy. In large part? Because this is all happening in my husband's hometown: Alamogordo, New Mexico. 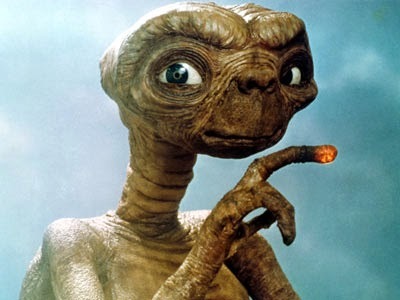 Not only that but the E.T.-filled landfill, which had become an urban legend of almost mythic proportions, is just a pop away from his childhood home, which was, at one time, a TraveLodge motel. Here's my guy's childhood swimming pool, and the pool that got me to thinking about Motel Fairwil's pool. The pool is long gone and the motel has changed hands (so my in-laws no longer own it). But this week's story of the E.T. 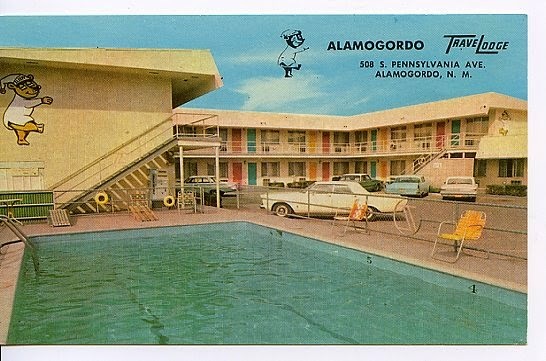 games got me thinking about this particular motel and pool, my strong ties to it, secrets underground, whimsy, nostalgia, and, yes, sweet little aliens. By the way, the desert around my husband's hometown? Very big with the UFO sightings. Yep, Roswell is nearby.